Like foundations, concealers come in many different forms, from powders and liquids to creams and even pens. Perhaps my favorite form is cream, as I find these concealers have better coverage, but can also be worn sheer. If you have good skin, you can also get away with just wearing concealer and a light layer of powder. 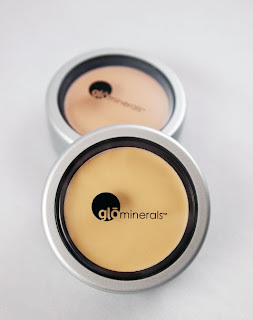 GloMinerals makes one cream option: the Camouflage Oil-Free. This concealer provides medium coverage, but can also be applied more sheer. Like all creams, I recommend applying over primer and sealing with a powder foundation or finishing powder for longevity. I also recommend applying sparingly near creases or fine lines, so it doesn't settle. This concealer comes in four shades. If you're having trouble choosing, check out my review of their under eye concealer, which comes with two shades. This product rates about a moderate 3 on the EWG Skin Deep database, which is weighed down by the use of retinyl palmitate (vitamin A). I'd love to see a version which removes this ingredient, to make it even more gentle. If you're looking for a relatively gentle cream concealer, this is a nice option.